Fin rot is caused by fungal or bacterial infection, resulting in jagged fins. Other symptoms include decreasing appetite and whitish color. The fish will die if left untreated. The infection signs start from the fin tips. If the infection reaches the fin base, the fish cannot regenerate and must be discarded. To treat the fish, catch it and apply malachite green on the infected part. Treat the water with antibacterial solution and antibiotic food. Separate the infected fish from the healthy ones until the treatment is done. Ich is a disease caused by water protozoa. Ich results in white spots, pimples around the fins, and mucus layer on the skin. The fish may rub their bodies vigorously against a hard surface or become lethargic. Their eyes turn milky, and they lost their appetite. If left untreated, the fins will be frayed, and the fish die. The white spots are sacks containing protozoan embryos. You can increase the water temperature until these sacks burst. Raise it to 90 degrees Fahrenheit (around 32 degrees Celsius). Add a teaspoon of salt into the tank. Take out all the ornaments and disinfect them. Replace the vegetations just in case. New Tank Syndrome is a situation where fish suddenly die after being introduced to a new tank. This happens because the water still does not have enough bacteria level to support the water’s biological cycle. The signs include cloudy water, bad smell, and sudden fish death. To avoid it, fish owners must cycle the tank water before putting new fish. Wait until the nitrate and ammonia level are zero. Use proper kits to test the water condition. 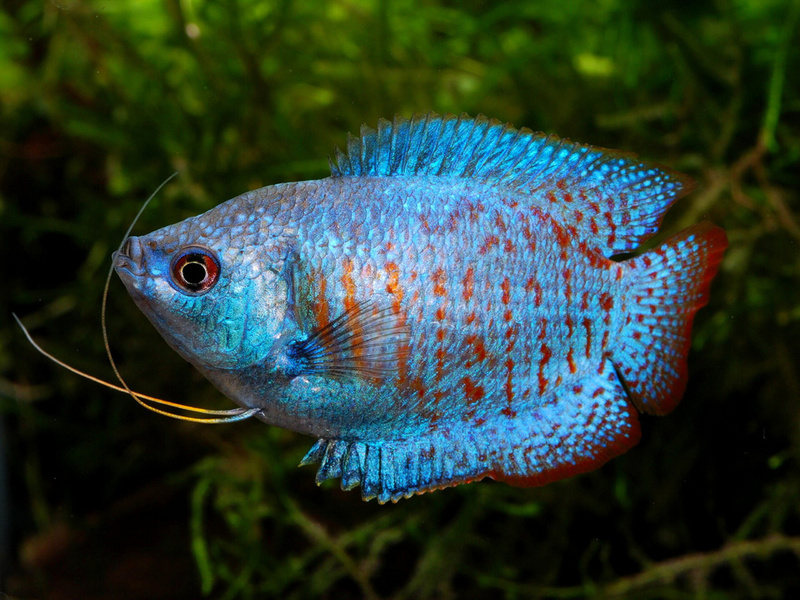 Dwarf Gourami Iridovirus is a recently found among freshwater fish breeders. The virus was first noticed among imported fish from several East Asian countries. The viral infection does not show symptoms until the fish are too weak. Symptoms include difficulties in breathing, loss of appetite, bloated appearance, discoloration, and death. There is still no cure for DGIV. When you see these signs, it is better to remove all the infected disease and disinfected the tank (and it's content). Make sure to obtain your fish from trusted, reliable breeders. Dwarf gourami fish disease affects your fish’s appearance and lifespan. Make sure to understand the symptoms and the best way to treat infected fish. Why Should You Start Farming Dwarf Gourami?